Pssst … Have You Heard? No, I don’t think it is. In fact, I think it’s just another variation of gossip. But this got me to thinking. What is gossip? Is it good, bad or in between? Does it serve a purpose? Is gossiping so engrained that we can’t help it, or should we work to minimize or eliminate it? As with almost all sayings, this appears snappy and smart, but upon closer examination doesn’t hold up. Many of us have minds that are ever changing – small one minute or day, large the next. If we are analyzing ideas, how can we not mention the people who create them, write about them, or run for public office spouting them? We are not either/or, one way or another and neither is gossip. The word gossip has a variety of meanings. Its Old English origin is godsibb, from god and kinsman, meaning godparent. In Middle English, it came to mean a close friend with whom one reveals personal information about others. Today, this can mean anything from “chatty talk” to sensational facts or rumors. There are times when I would prefer to hear gossip – for example, if a co-worker overhears the boss saying there are going to be layoffs, or if a friend sees my husband kissing another woman, or if a neighbor reports a stranger lurking on our street or that another neighbor is in the hospital. This is information I can use to protect myself or to help someone else. There are times when I do not want to hear gossip – the malicious kind making fun of a person or spreading untruthful rumors. Whenever I do hear unpleasant gossip, I picture 18th century ladies in wigs surveying the ballroom and clucking away behind their fans. Some gossip kind of falls in the middle. So and so’s marriage is in trouble. Did you hear his wife ran off with the gardener? Did you know she had to file bankruptcy? This information may or may not be useful. It sometimes gives us a momentary high, like chocolate. “At least that hasn’t happened to me,” we think. But then it leaves us with the sugar blues letdown and a bad taste in the mouth as we realize it could happen to us and most often people need our compassion. I usually don’t offer my family, friends, or anyone, advice unless they ask for it. I am not perfect. I do indulge in chocolate. I may think to myself, “He should leave that job or that woman,” but I try not to say it out loud. And if it does slip out during idle chatter, I hope my fellow gossip reminds me I am on a healthy diet and that I need a clear mind and heart. 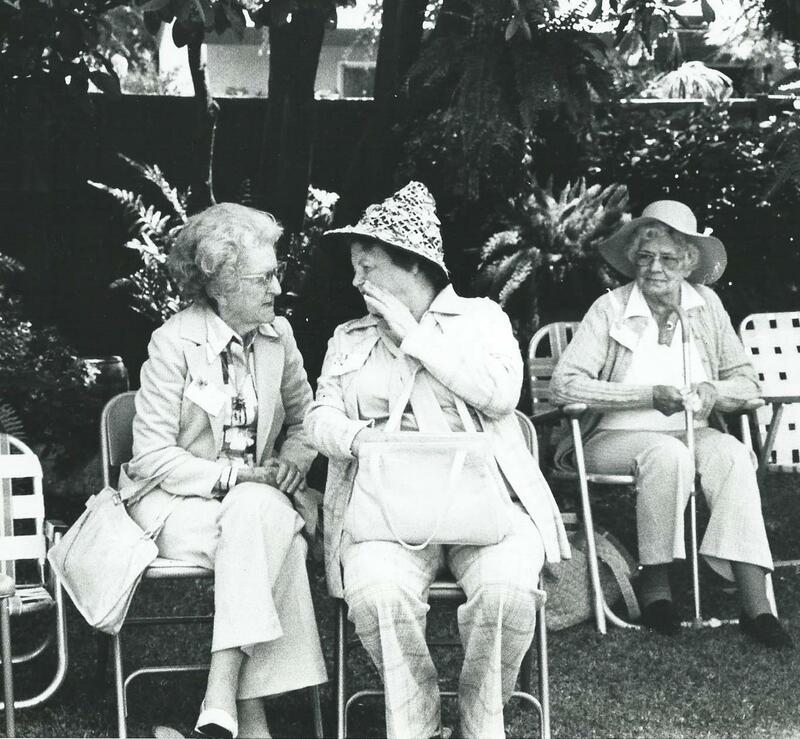 A note about the photo: I took this in 1980 while covering a garden party for a local newspaper. How ironic, that with all the different modes of communication we have now, and the immediacy of it, our culture all but ignores the art of good conversation.